Manchinbele reservoir was the destination. Naren, Sac, VV and myself started off towards the place at 4pm and reached by 5pm. The sky was not as clear as I hoped it would be. Nonetheless, we were in time to view the setting sun. Apart from the usual sunset landscapes, I got an idea while shooting the reflection of the sun in the water. I was just thinking that it would be much more interesting if there was a subject in the water - like a boat moving across the water. 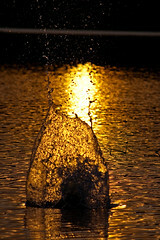 Since there was no such naturally available subject, thought why not create one of our own - a splash of water. Naren volunteered to throw pebbles into the water. Got some 3 decent shots in 10 attempts. One of them is seen along with this post.